In 1909 Galway was at a low ebb, the population was just over 3,000, the local economy was in poor shape, the canal and the docks were not being well used commercially, the student population of UCG was 131, there was very little manufacturing, and local politics was still bedevilled by the Parnell split. There were two local newspapers, The Connacht Champion which actively supported William Smith O’Brien MP and often virulently attacked the Irish Parliamentary Party, and The Galway Express which originally supported the conservative unionist viewpoint, but which gradually became more nationalist until its premises were wrecked in 1920 by the Black and Tans. In 1909, Tom ‘Cork’ Kenny was working as a reporter in the Connacht Champion when he was approached by Gus O’Reilly who hoped to secure him for a paper he wanted to start in opposition to the Champion and which would support the Irish Parliamentary Party. O’Reilly had a few thousand pounds which would be enough to start this new paper which was called The Connacht Tribune. It was managed by O’Reilly and edited by Kenny. They established themselves on the site of an old nunnery in Market Street. The first edition was published on May 22 1909 in which they declared that they “Would support the Constitutional Party of the Irish people and the fullest freedom that the Irish people could obtain; the preservation of the Irish Language and the economic independence of the country through the development of agriculture and industries”. After the Rising, the Tribune became more nationalist in tone. During the War of Independence, the train drivers’ refusal to carry armed soldiers or police brought the country’s railways to a halt, so no daily papers were delivered. The Tribune filled the gap with a four page A4-sized daily paper that carried the important news from home and abroad. It ran from November 29 to December 29. The Black and Tans later threatened major violence on the paper if they did not tone down their coverage. The paper has undergone many changes since in its format and type of content. 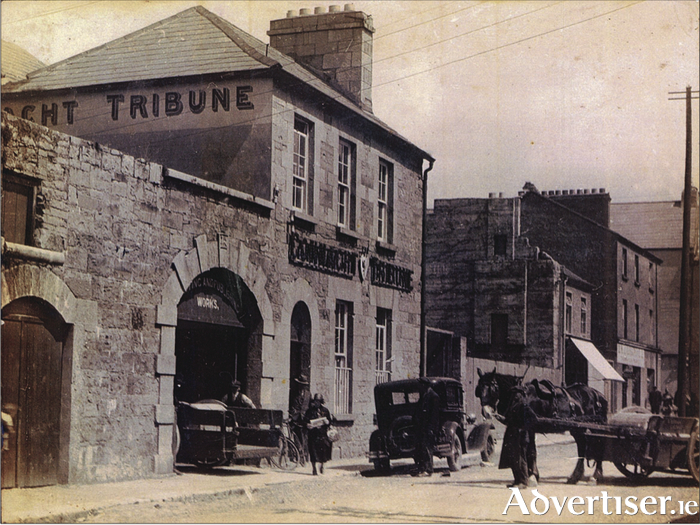 Our photograph of the premises was taken in 1932 and shows huge rolls of newsprint being delivered by horse and cart. The Tribune building we see was replaced by the current structure in 1971. There was some interesting stonework on the old building. The gable we see on the remaining buildings on the street is exactly the same today.